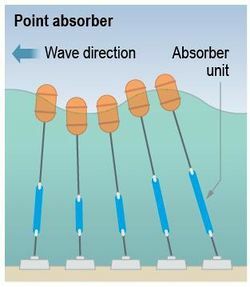 Wave energy capture device, with principal dimension relatively small compared to the wavelength, and is able to capture energy from a wave front greater than the physical dimension of the device. There are floating and submerged models. 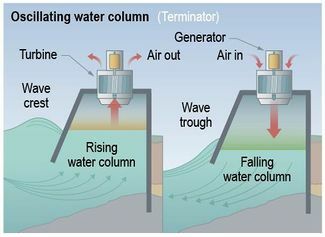 Partially submerged structure that encloses a column of air above a column of water; a collector funnels waves into the structure below the waterline, causing the water column to rise and fall; this alternately pressurizes and depressurizes the air column, pushing or pulling it through a turbine. There are shore-based and floating models. Partially submerged structure; a collector funnels waves over the top of the structure into a reservoir; water runs back out to the sea from this reservoir through a turbine. There are shore-based and floating models. Wave energy capture device with principal axis oriented parallel to the direction of the incoming wave that converts the energy due to the relative motion of the parts of the device as the wave passes along it. 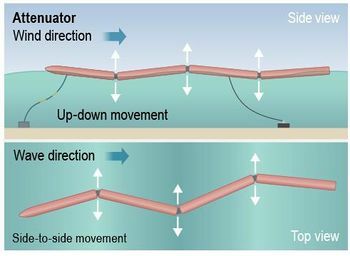 Any of several devices that capture wave energy directly without a collector by using relative motion between a float/flap/membrane and a fixed reaction point; the float/flap/membrane oscillates along a given axis dependent on the device; mechanical energy is extracted from the relative motion of the body part relative to its fixed reference. Typically has two or three blades mounted on a horizontal shaft to form a rotor; the kinetic motion of the water current creates lift on the blades causing the rotor to turn driving a mechanical generator. These turbines must be oriented in the direction of flow. There are shrouded and open rotor models. 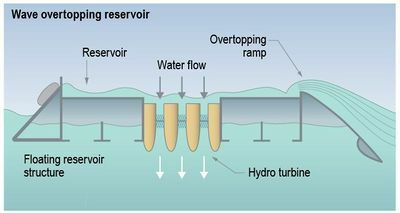 Typically has two or three blades mounted along a vertical shaft to form a rotor; the kinetic motion of the water current creates lift on the blades causing the rotor to turn driving a mechanical generator. These turbines can operate with flow from multiple directions without reorientation. There are shrouded and open rotor models. Uses the flow of water to produce the lift or drag of an oscillating part transverse to the flow direction. This behavior can be induced by a vortex, the Magnus effect, or by flow flutter. Similar to an airplane wing but in water; yaw control systems adjusts their angle relative to the water stream, creating lift and drag forces that cause device oscillation; mechanical energy from this oscillation feeds into a power conversion system. These systems use fluid with a low-boiling point, such as ammonia, to rotate a turbine to generate electricity. Warm surface seawater is pumped through a heat exchanger where the low-boiling-point fluid is vaporized. The expanding vapor turns the turbo-generator. Cold deep-seawater—pumped through a second heat exchanger—condenses the vapor back into a liquid, which is then recycled through the system. These systems use the tropical oceans' warm surface water to make electricity. When warm seawater is placed in a low-pressure container, it boils. The expanding steam drives a low-pressure turbine attached to an electrical generator. The steam, which has left its salt behind in the low-pressure container, is almost pure fresh water. It is condensed back into a liquid by exposure to cold temperatures from deep-ocean water. These systems combine the features of both the closed-cycle and open-cycle systems. In a hybrid system, warm seawater enters a vacuum chamber where it is flash-evaporated into steam, similar to the open-cycle evaporation process. The steam vaporizes a low-boiling-point fluid (in a closed-cycle loop) that drives a turbine to produce electricity. This page was last modified on 21 March 2018, at 10:48.